Ever since the Democrat and Chronicle published on November 23, 2014, its article praising the newly-NY-Regents-approved, 22-year-old Ted J. Morris, Jr., for the 2015 approval of his Greater Works Charter School, much Morris-induced (mis)information has been flying through cyberspace on this man. Indeed, with the new information that has come my way in the last 24 hours regarding Morris’ credentials and experience, my post dated November 24, 2014, has been updated numerous times, and still the information comes. Even the Democrat and Chronicle (D&C) has attempted to straighten out the story on Morris. However, much of the information in that “update” lacks verification. So, what do we know about this young man who persistently petitioned NY Regents beginning in 2010 to start a charter school? Morris had previously stated that he graduated from Penn Foster in this charity bio. As D&C notes, no one from Penn Foster could be reached to verify Morris’ statement. So, there is as of yet no clear word on Morris’ high school completion credential. Next, on Morris’ Linkedin bio ( accessed here: http://i.imgur.com/xGohi4g.jpg), he states that he graduated in 2008 with a bachelors from Salt-Lake-City-based online school, Western Governors University (WGU). D&C also found this to be false. Morris attended online classes at WGU but did not graduate. No WGU graduation for Morris. On that we are clear. The November 25, 2014 D&C update states that Morris’ 2014 charter application “did not include a resume,” but this is not correct. Morris resume can be found on pages 146 and 147. It includes much of the same questionable information as the Linkedin bio I address in my original post. The D&C article apparently relies on Morris’ bio from the 2013 application for Greater Works Charter. Recall that WGU confirmed that Morris did not graduate from WGU. The second D&C article stated that Concordia University Chicago could not be reached for comment. Ted has a B.S. in Human Services, an M.S.W. in Non-Profit Leadership and is finishing up his Ed.D. in Administration. So, “Dr.” or no “Dr.”? In November 2014, Morris clearly refers to himself as “Dr.” The first identifier on his Twitter page is “Doctorate in Education.” Again, as I noted in my original post, neither ProQuest nor UMI has any record of a “Ted J. Morris, Jr.” as having written a dissertation. The short of it: This guy is lying about his credentials, and NY Regents just approved him to run a NY charter school at $12,340 per student for the life of the charter (see page 56 of 2014 application), with 96 students approved for 2015-16. Morris admits in the second D&C article seeking his charter board “through posts on Craigslist, Linkedin, and websites for nonprofits” and has used their credentials to help dress up what is an impressive charter operation on paper. D&C could not reach either of two NY Regents members for comment on Morris’ application approval. If NY Regents really has students’ best interests in mind, it would seem that thorough checks on the references of charter applicants would be in order. The credential shell game Morris is playing should have been a huge red flag waving pre approval. He submitted his resignation Tuesday afternoon, according to Peter Kozik, a Keuka College professor and fellow trustee who now will take over as lead applicant. However, do not be quick to assume that Morris is walking away from the charter he has been planning for since 2010 (and falsely advertising as an existing school on Linkedin). On the already approved 2014 charter application, Morris labels himself as “lead applicant for an founder of GWCS (Greater Works Charter School)” (page 40). So, even though he might be replaced as “lead applicant,” he can still cash in on this “founder” title– and based on the content of this post alone, one can see that Morris is all about milking the title. Moreover, board members are limited to two consecutive terms of as much as three years per term– and they cannot be compensated (see page 41). In contrast, the CEO is as of yet an undeclared position– and CEO is a position that is compensated. Will Morris be CEO? Who knows. But I find it difficult to believe that Morris will not use his “founder” status as a springboard for more lucrative ventures. “But Kristin Rapp, the founder of Sparq Rochester, said Morris was an ineffective leader in that organization who alienated many of his early supporters. Note the other Groups Morris belongs to on his LinkedIn page, including the “Think and Grow Rich” book group, which was inspired by Andrew Carnegie. He was planning to get rich quick off tax dollars by emulating a robber baron. I don’t think Morris could have pulled this off alone. Look at all the supporters on his LinkedIn page who rated his “Top Skills” and those who provided recommendations. They, the charter’s board and the Regents are just as suspicious as Morris and should all be investigated for the roles they played in perpetuating this fraud. As many here predicted, New York State Regent Meryl Tisch has just told reporter Justin Murphy that Morris’ fraud is no big deal, and that Greater Works Charter School will still be opening, albeit without Morris. As for anyone being held accountable for Morris’ fraud going undetected, that’s no big deal, either. Tisch hedged on implicating anyone on any level. In short, nothing really serious went wrong here, and whatever did go wrong was nobody’s fault anyway… so let’s all just move on, now, shall we? “A day after 22-year-old charter school founder Ted Morris Jr. resigned precipitously after lies were discovered on his résumé, state Board of Regents Chancellor Merryl Tisch deflected blame for the charter’s approval and said the school, without its founder, should still open next fall. “Tisch said the board only sees applications after they’ve been recommended by the state Education Department, suggesting it wasn’t the members’ normal responsibility to vet them for errors. “Bill Clarke, the director of the NYSED charter school office, was not available for comment. A NYSED spokesman said no one else would be available either because of the snow descending on Albany. ” ‘I believe Regent Brown and Regent Norwood were kept in the loop with this charter school coming forward, and the issue of (Morris’ biographical information) did not surface. “Greater Works’ new board chairman, Keuka College education professor Peter Kozik, said the school still intends to open in the fall, and Tisch said she believes that is proper. My prediction: once a comfortable amount of time has passed and the spotlight’s off, Morris will be re-hired, and back in the Greater Works fold, with a fancy title and a six-figure salary…. and there’s nothing anyone can do to prevent this. What Morris shared sounds like the recipe for an unmitigated disaster. Look what Greater Works has in store for their future students and the Rochester community! With or without Morris, this is what’s ahead. When Greater Works CC does open, most of the teachers that you’d see as a traditional high school won’t be there (SEE BELOW). “The (Greater Works) school will be largely computer-based, which will free the teachers up for one-on-one tutorials where needed. Hmm, no time wasted literally writing HOURS worth of lesson plans, like 34, or so a week…. I’m just sayin’. “For some reason, libs are not too ‘keen’ on charter schools. One can ‘choose’ whether to grant life to a kid that would potentially attend the school, but not allow said kid, or parent a choice in selecting the school. “Ted Morris is a freshly-minted Ph.D., and he has that oh-so-rare attribute largely lacking in academia; ummmm, LOGIC! He will be opening this charter school in Rochester, New York, in 2015. “Instead of funneling all of the students towards college, the school will also encourage the military or other career choices. F.Y.I. our ‘trade’ industries are really lacking trained workers which is why former Texas gubernatorial candidate Tom Pauken brought attention to that matter. Not sure which word is apropos: surreal or painful. Maybe both? Amazing. I have to jump through all kinds of hoops just to keep my teaching license active, and this yahoo gets handed a charter and all the money that comes with it despite being a liar. Ed deform at its finest. For the kids! I’m with you, NShrubs. We’re still paying off our daughter’s college, took her 3 years to get a teaching job in public school, and she had to jump through the same hoops, and even now, with the evaluations, her future is in jeopardy every year, even if she gets tenure, if it yet exists, in 2 more years, assuming they will rehire her for the next 2 school years. What in the world is wrong with the state of education if certified, creditable, vetted, educated, qualified teachers are treated like dirt, and turds like the fake “doctor” Morris are handed schools at 22 years old? This is criminal. Someone should go to jail, and the Regents should be fired. Ugh. We still have due process, but I’ll be paying off my $40K in student loans for my teaching degree until I’m collecting social security. Assuming that still exists in 25-30 years…. Hope you can get this version to the right people, and that it makes a difference. The guy should be in jail or clearly labeled a pathological liar. The D&C article has changed yet a 3rd time in just 24 hours. Heads should roll, starting with this criminal master mind “doctor” Morris, along with his cohorts, and all of the Regents. If this doesn’t tell us what charters are all about, nothing does. If it wasn’t so serious and criminal, it would be laughable. When if ever will our kept mainstream media pick this up? He is nothing more than a charlatan who will end up pocketing most of the charter money and leave those kids and their parents with empty promises. This young man’s habit of self-crediting unscientific fallacious attributes for the embellishment of academic credentials just resonates with a story of Doctor Guest. Of course, Mr. Morris is way much younger than Doctor Guest, who made not only fallacious publications at ELT news website but weaseled out his fabrication at academic conference in Japan but 4 years ago. Mercedes, The file for Morris’ 2014 Charter Application keeps saying it’s damaged and can’t be repaired. Have another link for that? Now fixed. Thank you for bringing it to my attention. Wow! Morris has different schools listed on his resume than what he listed on LinkedIn for all three degrees. Concordia University and Concordia College are different schools in different locations and I highly doubt a real graduate with both a BS and an MSW would confuse them, but the doctorate is particularly humorous. It’s listed as being from two entirely different schools and even the EdD majors differ! What a bad liar he is! Where is the FBI when you need them? Charge every single person associated with this fraud and use them as examples for those out there already perpetrating this fraud; those have done so in the past and think they got away; and those planning on perpetrating it. Both applicant/s and school board members that grant such criminally dubious charters should spend some quality time in federal prison because federal money is involved! Does anyone remember Tom Termotto, circa 1985? This is the one of the best local stories I’ve seen since then of a delusions-of-grandeur type coming out of nowhere … and getting pretty far down the line before people caught on. Here are a couple of points I’d like to see brought out: where were his parents in all this, being that the good Doctor is only 22? What is his background; what do people who knew him in his much younger years say about him? Why has he held down so many different jobs and been to so many different schools, possibly not having graduated from a single one of them? Has he ever gone for counseling, because IMO anyone that young who fibs to that degree has a genuine psychiatric condition. So his high school diploma is from online. His online BA is apparently non-existent. And his PhD is from online. How DOES one get a PhD (or an MSW) without a valid BA anyway? Also, since his diplomas and degrees are all from online sources, IF he applied to these institutions online, wouldn’t any impropriety in online applications be subject to federal or other penalties? Apparently he has very little non-virtual classroom time at all. At the very least, the Board of Regents should be called out on this one and pressed to review the entire charter school application! Shell game, or not, isn’t this also about who gets the taxpayers’ dollars? I think it’s possible that the NY Regents are most if not all neo-liberals, who have been deliberately planted in their positions after being vetted for worshiping at the profit altar of Milton Friedman. They don’t care if the people who run Charter schools are qualified or not. They only want warm bodies who will help them achieve their goals based on the gospel of Milton Friedman. Everything is about profits and more profits with no humanity or qualifications attached. To neo-liberals, profits are god and everyone else is manure to fertilize the crop that leads to more profits and wealth for the few who have ruthlessly climbed to the top or as close to the top as they can get. 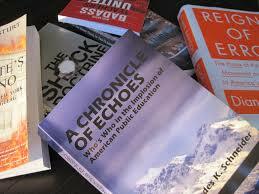 Junk Schools are doing to education what junk bonds did to the economy. They are the same sort of scam being run by the same sort of operators that we’ve seen before. It is time to call the what they and stop letting hide behind the name of reform. “We’ve already seen how nobody at the Board of Regents or the New York State Education Department wants to take responsibility for giving a charter school to a con man who lied about having a BA, an MA, a Ph.D, a MSW (yeah, that’s a new one) and maybe even his high school diploma. “Lying about credentials and work experience on a state application for a charter school is a ‘mistake’? “What exactly, under this definition of ‘mistake,’ entails ‘fraud’? “It is amazing how much these pro-charter people are willing to forgive when it comes to charter schools and charter school folks. “It seems accountability is only for public schools and public school staff. Here’s a news story with a handsome, telegenic male reporter who forget to check if Morris had actual credentials… and Morris arguing that his lack of experience actually gives him an advantage over seasoned education professionals.